This article originally appeared on FoodBeast.com on 3/12/19. Astro Doughnuts & Fried Chicken, known for their mastery of both delectable choices, are capitalizing on the legalization of marijuana for recreational use in California by creating a new iteration that's infused with CBD. For those unfamiliar, CBD (short for Cannabidiol) is a natural compound found in the resinous flower of cannabis and is known for its therapeutic properties. CBD-based products and foods are currently booming, so Astro threw their hat into the craze and just created CBD-infused doughnuts that continue their penchant for exquisite treats. 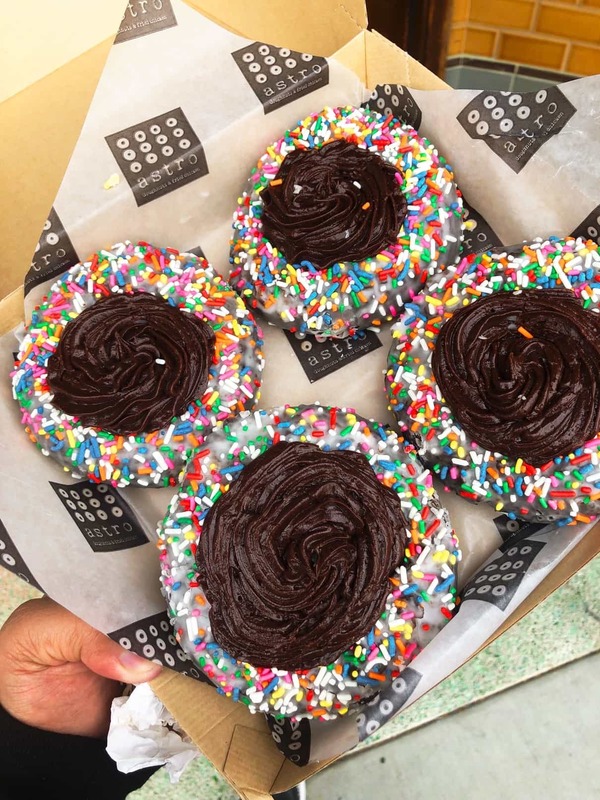 The doughnut, which in specific is a Chocolate Birthday Cake Doughnut with CBD-Infused Chocolate Buttercream Frosting, is a welcome treat to Angelenos looking to take their already notoriously chill Cali vibe to deeper levels of relaxation. And at 60mg of CBD in each doughnut, eating one whole will have you feeling like you're wrapped in a veritable Snuggie of chill mode. Trust me, I was the happy guinea pig to try. These CBD chocolate doughnuts are going for $5 a pop and are currently available at the Downtown Los Angeles location of Astro, with availability soon at the forthcoming Santa Monica location opening at the end of March. Happy chilling and munching, L.A.
Reach loves the Lakers, fried chicken, and a well-executed DDT. He came out the womb with a fried egg on top of his head.